Here are some helpful guidelines for using SPLENDA® Sugar Alternative, Granulated, instead of sugar in your own recipes. SPLENDA® Granulated offers a way for you to enjoy your favourite recipes without all the calories from added sugar. Use these top tips when cooking & baking with SPLENDA® Sugar Alternative to adapt your recipes. SPLENDA® Granulated measures and sweetens spoon for spoon like sugar and works really well with stewed fruit, sauces, hot drinks and in places where you simply add to taste. Sugar contributes volume to many recipes. 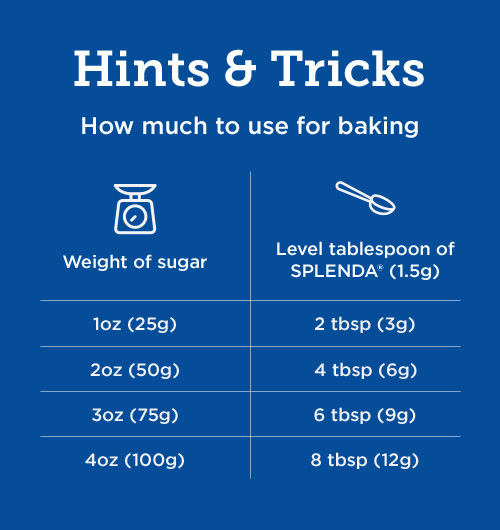 Whenever you use SPLENDA® Granulated instead of sugar, you may notice a smaller yield. SPLENDA® Granulated does not sift like sugar because the sugar granules are different. If the recipe calls for sifting the dry ingredients, measure the amount of SPLENDA® Granulated you need and add it to the other ingredients after you have sifted them. Remember, one spoonful of SPLENDA® Granulated equals the sweetness of one spoonful of sugar (but weighs much less). When the recipe calls for creaming ingredients together, such as butter, SPLENDA® Granulated and eggs, you may need to beat the ingredients a little longer to get enough air into the mixture to result in a more fluffy and even texture. Baked goods made with SPLENDA® Granulated do not brown like recipes made with sugar. To achieve a light brown colour take out your recipe 2 - 3 minutes before the end of suggested baking time, and glaze with a small amount of egg white, milk or honey. Check your baked goods 7 - 10 minutes before the end of the suggested cooking time (1 - 2 minutes for biscuits) as some products cook more quickly with SPLENDA® Granulated. Also use the skewer method to test (it should come out clean), as it is more reliable and will tell you whether the centre of the food is cooked. As SPLENDA® Granulated tends to absorb more liquid than sugar, try adding extra skimmed or semi-skimmed milk, fruit juice or water to your cakes and bakes if the mixture feels too dry. For example a sponge cake should be of a dropping consistency i.e. should drop easily from the spoon within 3 seconds once mixed. If this does not occur, stir in 2 - 3 tablespoons more liquid. For added moisture when using dried fruits, try soaking them for 20 minutes in liquid (e.g. fruit juice, milk, tea, water) prior to adding to the recipe. Products made with SPLENDA® Granulated will last longer if stored in an airtight container in a refrigerator. Most can also be frozen for even longer storage. Try adding 50g of skimmed milk powder (sifted) and ½ teaspoon of bi-carbonate of soda for every 8 tablespoons of SPLENDA® Granulated to increase the volume. Add these to the dry ingredients. Otherwise follow the recipe's instructions. Separate the eggs, adding the yolks as normal. When all the other ingredients have been combined check that the mixture is or a dropping consistency, adding additional liquid (e.g. skimmed milk or water) if necessary. Whisk the egg whites until stiff, then fold gently into the mixture. Bake as per the recipe. SPLENDA® Granulated lends itself particularly well to the ease and speed of an all-in-one cake method, where all the ingredients are combined at once, normally with the use of an electric mixer.